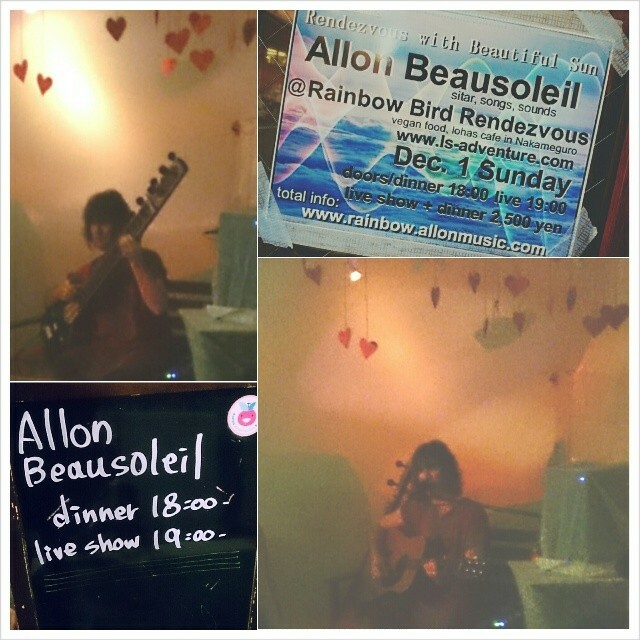 Allon Beausoleil was born deaf and with teeth. After a series of operations allon regained his hearing, opening him to a world of sound. Hailing from Portland, Oregon, his musical career was set in motion at the age of 10 when he heard Pink Floyd's "Wish You Were Here" album during a family trip. As the dynamics of the songs rose and fell it left him in tears and with a clear vision of his future he swore to himself, “That’s what I’m going to do”. 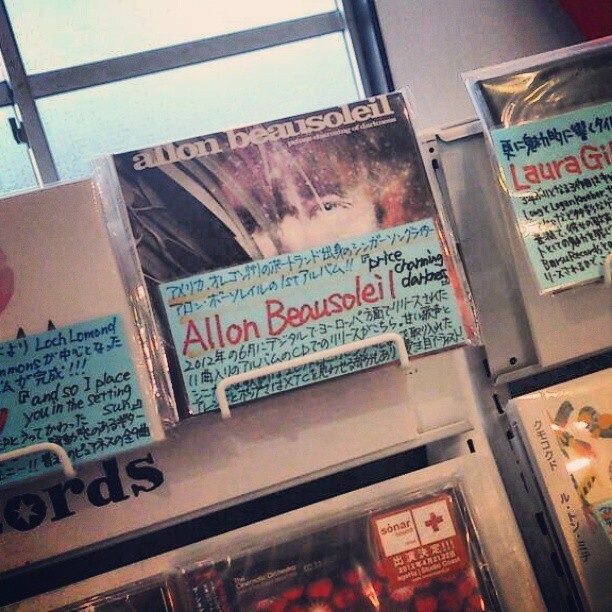 After starting and joining bands, most often as a guitarist and singer, allon decided to go solo.Since then he has shared the stage with such artists as Beck, The Dodo's, Rickie Lee Jones, The Head and the Heart, Sonic Boom and The Dandy Warhols to name a few. As well as playing live venues around the world he has also played at events for such fashion designers as Stella McCartney and Isabel Marant. Allon continues in the tradition of troubadours and wandering minstrels before him. 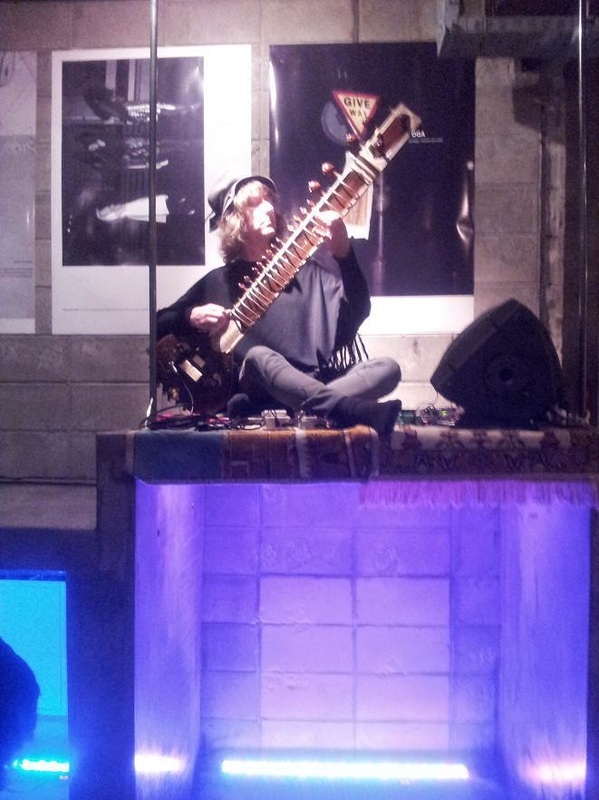 For 3 years he made his living traveling as a street musician playing the Sitar on the sidewalk or at any street festival he could find. He moved from Portland to NYC, from NYC to Tokyo and now travels the globe all the while playing live shows throughout Europe, Asia and the USA..
His sweet voice, combination of electronics with traditional instruments and intimate understanding of the production process creates music that is thoroughly modern, yet underpinned by a sense of nostalgia that stirs emotions. "Your voice is pure and unaffected, your lyrics moving . On his new full length album “Prince Charming of Darkness” allon explores the lines between pop, folk and experimentalism as he persists in his journey of sonic discovery. monde rempli de sons quʼil va alors découvrir, appréhender et aimer ! Allon se sent comme un troubadour, un ménestrel des temps modernes ! actuellement. Il va traverser plusieurs pays et y jouer plusieurs concerts. * Here's my cover of "Say Yes" by Elliott Smith I did for the Paperheart Music tribute album. * Here it is, "Thin Air" official video! 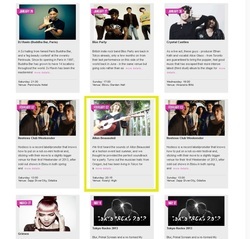 * My song "Dream Dictionary" peaked at #7 on the Ghana itunes chart, go figure! * Live in Salem, Oregon! Only USA spring appearance. 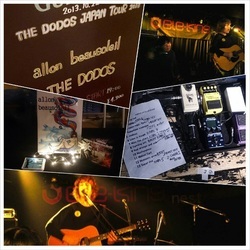 * Sold out show in Tokyo, thanks! 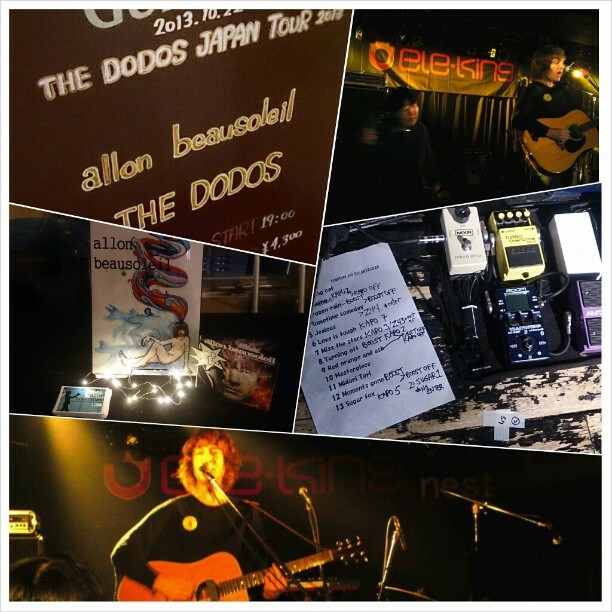 * It was a great show in Tokyo opening for the Dodos! * My cd is now available at a few select shops in Tokyo before the official release! 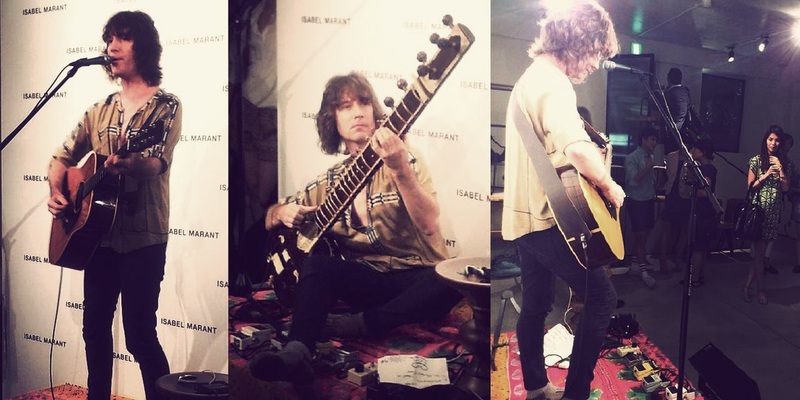 * While on tour in Paris I recorded a web session for Le Bruit de Graviers! 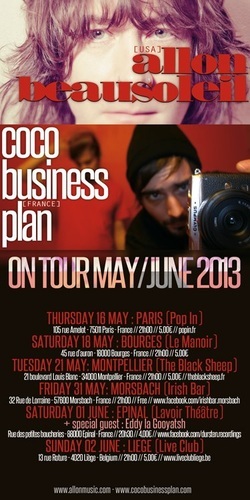 * My first headlining tour of France & Belgium! 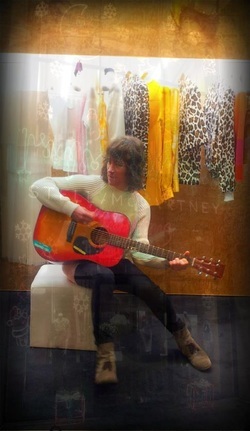 * I played at the Stella McCartney holiday event in Tokyo on Friday. It was a great night! * It was great to play the 15 year anniversary party for TOGA ARCHIVES. Congratulations Toga! 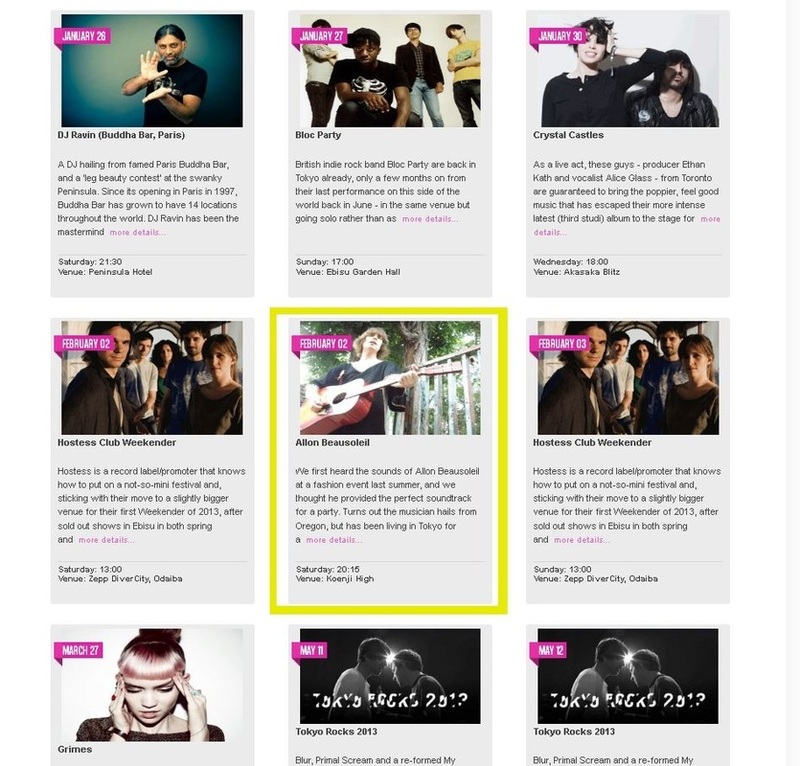 * I'm in Vogue, WWD, Numero and Sweet this month, playing and singing my little heart out. My song "Dancing Like Money" is the theme song for the VERT DENSE promo video featuring model Reina Triendl (トリンドル玲奈). Click the picture to watch. 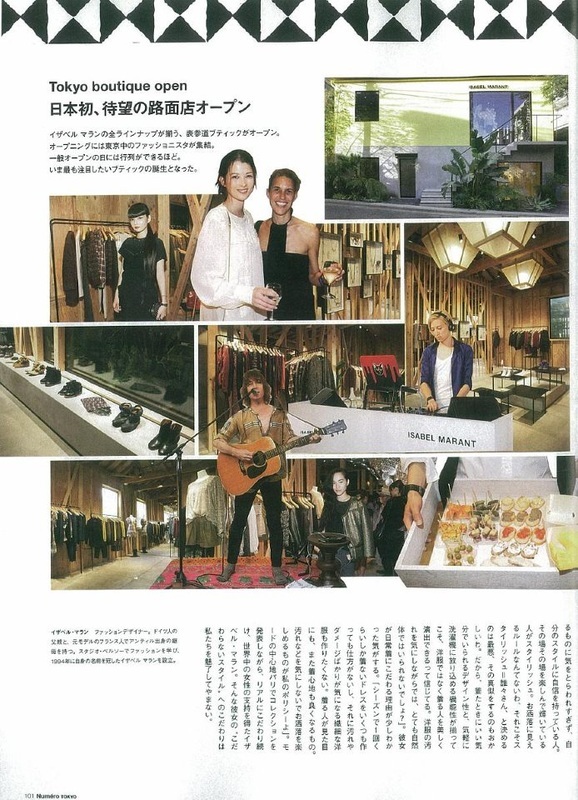 It was my pleasure to play at the opening of the Isabel Marant store in Tokyo on August 2nd. This young woman was really intrigued by the tuning of the guitar before the show.